While starting a Blog People take it as a funny game and thus select an uneventful Display Names like Admin, Owner and etc. However, after achieving the success they always feel regrets for not selecting their real name. Ultimately, they have to create a new account on their real name. However, those people who are using Blogger Platform can easily change their display name or the Author name without facing any hesitation whatsoever. There is no need to create a new account, or to connect external accounts with your blog because Blogger Platform provides an option within the Profile area that helps in changing the display name. 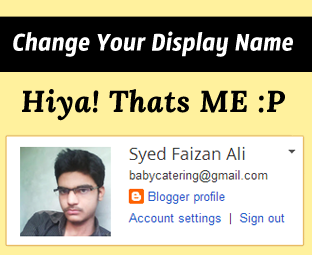 Therefore, today in this article, we will learn how to Change Your Display Name in Blogger. There is no rocket science behind changing the display name because Google provides a built-in option for changing the display names. Therefore, in order to change your display name or author name form Blogger Platform just login to your Blogger Account. Now on the Blogger Dashboard on the Top right corner of the screen, there will be an option just Select Blogger profile >> Edit Profile. We have attached a screenshot below so everyone can easily understand what we are trying to say. Now From here you can edit your profile as much as you like. Under the “Identity” category there will be three options such that, Username, Email Address, and Display Name. Out of these three only two are editable such that, “Display Name” and “Email Address”. Now it is up to a person what he wants to change, either edit the “Display Name” or the email address. After customizing your profile, scroll down to bottom of the page and just save the profile by pressing “Save Profile” button. This tip may appear to be a small one, but believe me there are tons of peoples who spends days and nights in discovering how to change their Author name. I have also seen lots of people who create a new profile for that sake of showing their real name. To be honest, I was also unaware of this feature because we hardly edit our Blogger Profiles. Similarly, many other peoples are also unaware of this functionality. What are your thoughts about this tip? Does anyone was aware of this technique. Take a lot care of yourselves till then, Peace, Blessings and Happy learning. Nopes, This Trick only works on Blogger Newer Interface. Blogger OLD Profiles are no more accessible. There is a Option in your Blogger Dashboard. Just Press your Current name on the top right corner of your screen and a small window will pop out that has the "Display Profile" option. I think webpage of blogger has been updated. Still can't get to what I'm looking for. I'd to show my 'NickName' on User displayed on my Blog. Beside, instead of 'Blogger Profile' it is showing now 'Google+ Profile'.